If you are looking for some gentle, therapeutic bodywork that acts not only on the physical body, but also the psychological and emotional aspects of being, then you’ve come to the right place. I have Shiatsu clinics based at Santosa on Albert Street in Leith and D.Atkinson Herbalist on Bristo Place, Edinburgh and I run 'Self-Care with Shiatsu' workshops across Central Scotland. I am passionate about working with people from all backgrounds, supporting them to be healthy and well in all areas of their lives: work, family and relationships. I support people when they are experiencing tension & stress, difficulties or big changes within their education, career, relationships or physical health. Shiatsu helps with the physical and emotional aspects of these situations. Clients come to see me as they move through life events: changes in career or relationships, pregnancy, post-pregnancy, peri-menopause, and entering the menopause and middle years. I support people when they are dealing with the symptoms of illnesses and coming to terms with chronic health conditions. Many people come regularly as part of their self-care routine in order to maintain their quality of life. I discovered Shiatsu for myself 20 years ago when I experienced ‘burnout’ within a stressful work environment. Shiatsu, with its emphasis on compassionate mindful touch, helped me deal with the physical & emotional aspects of stress and helped stabilise my body and mind. Regular treatments helped to connect me to what I truly wanted out of life. It gave me the resilience to make big changes and eventually I moved to Scotland and lived on Holy Isle, a small island next to Arran while I retrained to become a Shiatsu Practitioner. I moved to Edinburgh in 2014. I have trained with Glasgow School of Shiatsu and the Mindfulness Association. I have a Post Grad Certificate in Emotional Education. I am a Registered Member of the Shiatsu Society (MRSS). Finding the right therapist that you are comfortable with is important. So please feel free to call or email me if you have any questions or concerns and we can discuss what you need, your particular circumstance and symptoms. Shiatsu is performed on a futon or a massage table, fully-clothed. Please let me know if you have any mobility issues. You are fully clothed during your treatment. Bring (or wear) comfortable, loose fitting clothing and preferably socks. Jogging bottoms and a t-shirt are ideal. Shiatsu is a hands-on Japanese touch therapy (acupressure massage) which can support you to deal with the stresses and strains, and aches and pains that may occur in every day life. It can help with physical and emotional issues which may appear in the body as pain or illness. It can also help to maintain good health and well-being in a proactive, preventative way. As well as offering one-to-one private sessions, I also run group sessions in various settings across Edinburgh and Central Scotland. My aim is to empower people to help themselves in times of difficulty. During the workshops, I introduce the group to self-shiatsu techniques, acupressure points, self-compassion mindfulness meditations and some simple tension releases exercises to use in times of need to reduce feelings of stress, anxiety, tension. I offer these sessions in corporate and community settings and to the general public. If you want to know more how you can join one of these workshops, drop me a line. Shiatsu Connects - Community Shiatsu. I have a background in social care, and youth and community development. I am a qualified mindfulness facilitator (Mindfulness Association). As well as 1:1 shiatsu treatments, I am developing a Social Enterprise 'Shiatsu Connects'. I offer on-site seated shiatsu acupressure massage workshops for charities, community groups and corporate staff teams in Edinburgh and across Scotland. The workshop can tailored to the needs of the group, from 1 hour to all day workshops. These can include on-site seated, one-to-one Shiatsu sessions, and group sessions that give participants the chance to learn simple self-shiatsu exercises; acupressure techniques as well as mindfulness techniques. What organisations have said about Self-Care in Difficult Times workshop? "Jenny White is currently delivering regular Self-Care sessions for the Croft Carbon College, an education programme delivered by a small charity based in Leith called Leith Community Crops in Pots. This workshop has seen participants from a wide variety of backgrounds benefit greatly from learning practical, discreet and simple methods of using Shiatsu techniques to manage various symptoms associated with living and working in stressful environments or dealing with the aches and pains associated with a busy and congested life. Jenny is able to instantly create an environment where participants feel relaxed and comfortable whilst also being able to adapt the focus of the workshop based on the personal accounts and/or ailments that participants bring to the workshop. We’ve been delighted to include this workshop within our programme as we have seen the instant and visible benefits that participants have obtained from the learning provided by Jenny during this workshop. We hope to continue working with Jenny more in the future. The Croft Carbon College is a centre for raising environmental awareness within the community. 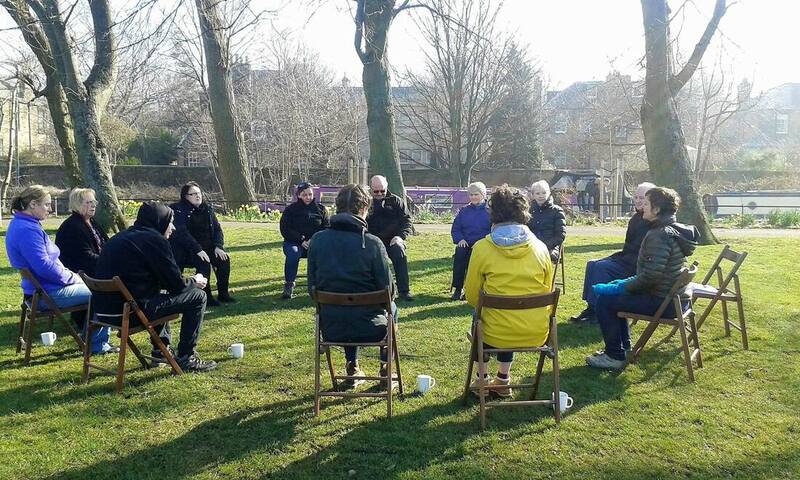 We provide accessible and engaging course, workshops and events that encourage Leithers to take personal and collective action towards a happy, healthy, leafy Leith!" Find me on Facebook: "Jenny Shiatsu"
Member of the Register of the Shiatsu Society (MRSS)​. "I was introduced to Shiatsu when Jenny White gave up her spare time to offer her services to anyone attending the Maggie's Cancer Care Centre and I'm very grateful she did. Having been diagnosed with terminal lung cancer 3 years prior to this I was in considerable pain and struggling to come to terms with my diagnosis. I now have regular sessions with Jenny, as I was pain-free for the first time since my diagnosis after my first few sessions. I have found it to be an essential part of my healing from cancer, PTSD and last year my sessions helped considerably after I suffered from two broken legs. Jenny is one of the kindest, caring people you can meet and clearly has a passion for helping people heal. After my sessions Jenny gives me advice and exercises and teaches me various different acupressure points that I can use at home to help with my healing. "